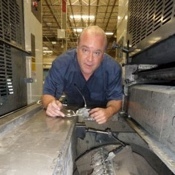 CARNEYS POINT, N.J. - To say that Brent Weaver knows Mitsubishi printing technology up and down and inside and out is something of an understatement. For the better part of his 25-year career, Weaver has plied his prodigious technical skills helping Mitsubishi press users in western states get the most out of their investment. In his new position as technical sales/service manager for RM Machinery’s (RMM) West Coast region, Weaver returns to familiar territory. He joins a press sales, service and parts team focused on sheetfed offset presses manufactured by the recently formed RYOBI MHI Graphic Technology Ltd. and web offset presses manufactured by Mitsubishi Heavy Industries Printing & Packaging Machinery, Ltd.
Weaver served as field service and technical support supervisor in the western region of Mitsubishi Lithographic Presses from 1996 through 2011. Factory trained in Mitsubishi offset equipment, he was responsible for press installation, service and repair. He also managed a group of mechanical and lithographic technicians meeting customer needs in the company’s western region. Weaver later worked for press manufacturer Koenig & Bauer AG as a field service and customer support specialist. Early in his career, he spent eight years as supervisor of a machine shop.